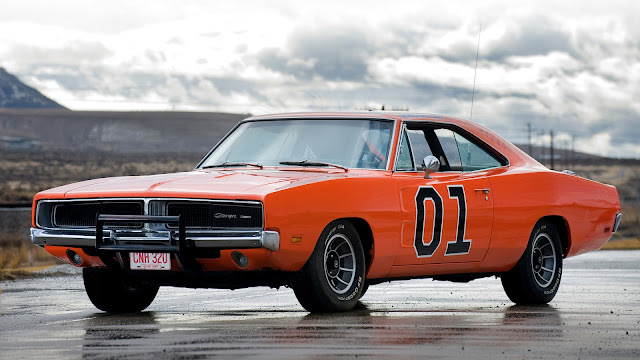 There are few cars as iconic as the Dodge Charger! Ever since Steve McQueen first trained his sights on one - in the movie Bullitt - it has been the stuff of legend. The 'muscle car' par excellence, it was the Dodge Charger that truly put Detroit on the map. Before the Charger came along, American cars were getting just a tad 'gaudy'. There is a limit to how much chrome - and how many fins - a car can take, before it starts to border on the kitsch. The Charger stripped things back to basics. Simple, straightforward lines defined a no-nonsense approach. The Charger was built to, well, charge ... and not much more. Its only concession to décor was the buttressed rear window! There could be only one motor for this masterpiece of machismo. A V8 was a shoo-in for the Charger power-plant. All that 'grunt', though, driving rear wheels into tarmac meant handling could be haphazard! That was best illustrated by the 'R/T' - Road and Track - version. Released in '68, it is the most iconic of the Chargers. Delivering 375bhp - or 150mph - the R/T was a heady brew of torque and speed. 0-60 arrived in six seconds - and the rest was not far behind! This time, though, rock-solid suspension parts - and anti-roll bars - enabled the R/T to handle as well as it went. It came with a 4-speed Hurst 'box. Front brake discs were optional. Yeah, right! The Dodge Charger was one of the last of the 'muscle cars'. It was produced until '78. After that, the industry took a more leisurely, safety-oriented tack. Never again would American roads resound with the ear-splitting din of cars like the Charger. The Dodge Charger is one of the most dramatic cars ever to have turned a wheel!